Linus Roth tells us all about his upcoming album: an inspiring video! 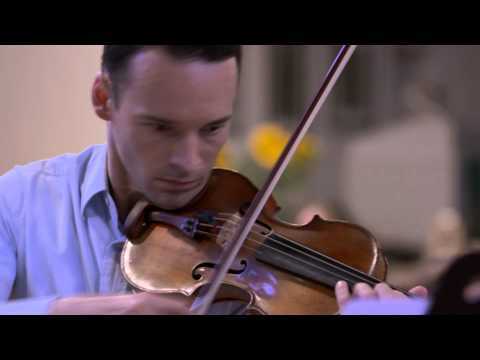 Weinberg's rarely released violin concerto played by Linus Roth! Dear Krzystof, you can buy a hi-res download on https://challengerecords.nativedsd.com/albums/violin-concertos. Enjoy the music. Sound fantastic, any chance to get it somewhere in high resolution download? "I could not find any weakness. Highly recommended without any reservation." "["].. It's a wonderful piece, and this performance boasts stunning orchestral playing from Ruben Gazarian's Würtemberg forces."" ["].. To coincide with the 70th anniversary of VJ Day, violinist Linus Roth and the Württemberg Chamber Orchestra Heilbronn put together this imaginitive disc of music composed in the Second World War and its immediate aftermath."" "["].. The album opens with "Concerto funebre" by Karl Amadeus Hartmann, a mournful work in which he sought to present "truth that spreads joy and is connected to grief."" "Best Concerto recording of 2014 - Maestro Kütson and the DSO Berlin musicians retain a significant degree of spontaneity in their realization of the evolving ground bass, and Mr. Roth complements their efforts with playing that combines lightness of touch with robustness of tone." "One from the ten of the year's most scintillating classical releases - This piece is terrific (...) Wonderful, full-blooded backing." "["].. The ongoing Weinberg revival received another boost in the form of Linus Roth's gripping traversal of the 1959 Violin Concerto, a dramatic, large scale work dripping with personality and good tunes."" "No. 9 of the 10 best classical recordings of 2014"
"One of the recording of the year"
"Linus Roth technical skill is beyond reproach. "The disc is recommended for the Weinberg––a work urgently worth getting to know––and for an idiosyncratic but effective rendition of the Britten." In short, an outstanding disc. " "Linus Roth with clean phrasing and rhythmical precision"
""Britten on Roth's disc has never sounded so soft or soul-baring."" "The interpertation of both concertos by Linus Roth is without a doubt sublime"
"(...) recorded in an exemplary manner. (...) here one can discover beauty and impressive parts." "If any performer can popularise the piece it has to be the phenomenal Linus Roth, whose unflagging energy makes this CD one of the best concerto discs this year. He is marvellous from the off. Unmissable, and recorded in sensational sound too""
"It’s worth getting this recording for the Weinberg concerto alone but with the addition of the Britten it becomes self recommending." "This is a highly desirable release played delightfully by violinist Linus Roth. It's worth getting this recording for the Weinberg concerto alone but with the addition of the Britten it becomes self recommending." ""Linus Roth is a mervelous performer, technically and musically. The surround sound is gorgeous." ""Sound tip - a thrilling force drives this concert from the first to the last note. A must for disoverers." "Do not Let yourself be put off by the relative obscurity of this repertoire: This is pure enjoyment"
""An unexpected good combination... a release that comes with sensational hifi-sound. Roth's strength is the emotion: induvidual shaping right up to creaking/scratching, an accelerando that takes someones breath, pure excitement - that is Linus Roth. ... cinema at its most."" "Overall, I cannot fault this recording, particularly the lush sound engineering. I can only hope that this disc can serve as a persuasive case to encourage other violinists to take up both of these works - but especially the Weinberg." "He (Linus Roth) is a Weinberg champion and what acclaim the composer receives after this recording has been out for a few weeks will be largely down to the violinist." ""... a powerfull virtuoso composition which the German violinst knows how to savor with decisiviness and creative power."" ""...a sovereign play of Linus Roth and the mellow playing of the Berlin DSO (about Weinberg). 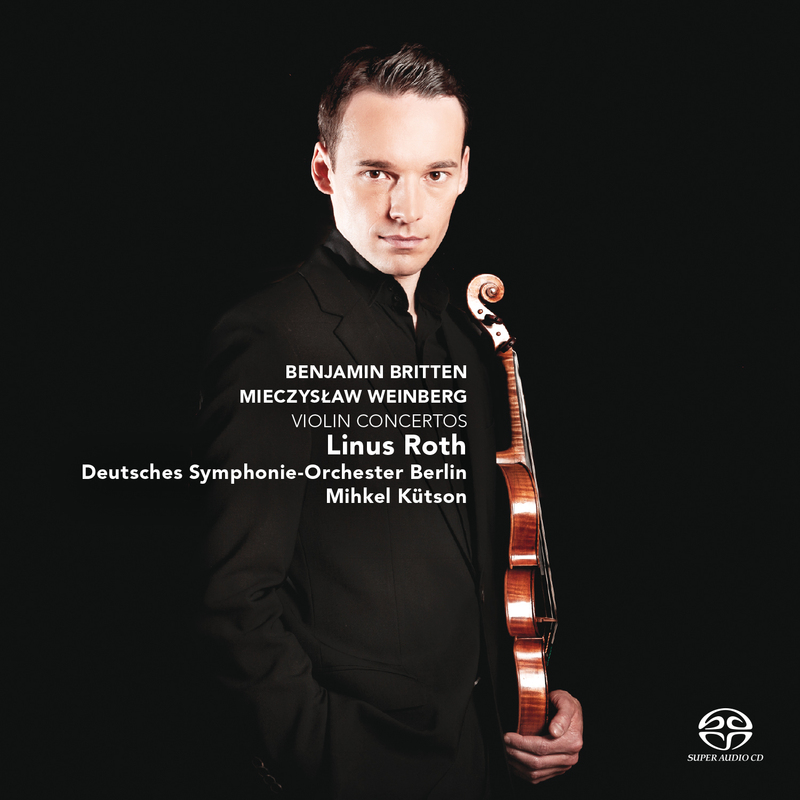 ... a convincing new recording of Benjamin Britten's violin concert."" ""The liner notes are as ecstatic as Roth's performance....""
"The talanted young German violinist Linus Roth has taken his music and his legacy to heart in a big way." ""The CD renders fitting exactly the brilliant sound expansion of the solist between a rich-revelling baseline and immensely filigree nuances."" "A quality disc that confirms that Linus Roth is indeed now one of the best violinists of the younger generation." ""This is a highly desirable release played delightfully by violinist Linus Roth."" ""What is clear is that this is a major work and one that deserves far greater knowledge.""